Just a reminder there will not be a Wednesday Hodgepodge this week. Go here to read my overly long explanation as to why not. No worries though...we'll be back with the random next week, May 17/18th. Continuing now the ongoing saga of my Washington adventure. This is Day 2. Really more like Day 1 because I didn't arrive until midday Sunday and every second counts when you live on opposite coasts. When we made our first trip to Seattle last May we had Mother's Day Brunch in the Space Needle. Pretty sure the law says you must visit The Space Needle if you're a first time visitor to the city, and it's definitely worth a ride to the top. As we made our way into the queue that day I noticed something lovely peeking out from behind the fence next door. 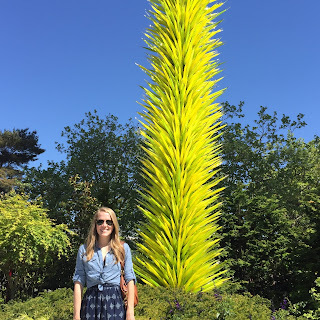 The Chihuly Garden and Glass Exhibit. Be still my heart. I might be his biggest fan. I told Daughter1 that was on my must-see list for next time, so first thing Monday morning we trekked into Seattle and did just that. Y'all I am totally in love with this man's art and talent. I first saw his work when we lived in the UK and he had an installation in Kew Gardens. Since then I look for the name Dale Chihuly when we travel and make it a point to seek out his beautiful glass works. These pictures will not do the beauty justice, but until you can see them for yourself photos will have to suffice. 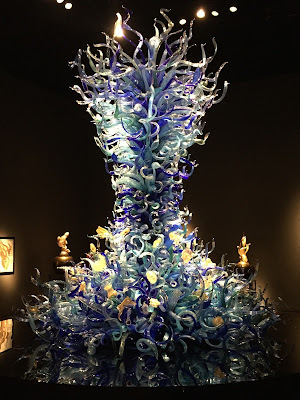 Just know they're enormous and bold and my daughter and I agree there's something very soothing about glass art. The 'spears' are as tall as I am if that helps put the piece in perspective. This 'under the sea' display stretched from floor to ceiling. My favorite pieces by far are the ones he sets so naturally in the garden. This is something Chihuly's known for and I would surely love for him to landscape a little corner of my lake lot. We had the best day. My daughter1 has a bit of the artiste in her so this was right up her alley. When we finished meandering in the garden we moved on to another of our shared loves...charming French cafes and long leisurely lunches. Moms of littles! Stay the course! Grown up girls will rock your world in a hundred thousand little ways. One day they're coloring at your kitchen table and the next they're by your side relishing the beauty of a Seattle Monday in a garden filled with glass. I saw this exhibit in Dallas a couple of years ago. Isn't it magnificent!!! Enjoy your week! The exhibit is breath taking! What's wonderful is simply having that time with your daughter. I know you're cherishing every moment. It's just a bonus that you got that spectacular setting. So pretty and amazing - I would love to experience this! The one in the ceiling reminds of the one in the Bellagio in Las Vegas. I think I told you about a beautiful piece of glass artwork in Pittsburgh too. I am putting this place on my bucket list. It looks like a great place to visit. WOW!!! Joe and I are both Chihuly fans too. The gardens are beautiful and I would definitely visit there should I ever be out that way. Loved hearing about your Day2 with D1. Those glass pieces are beautiful and so big! Must be amazing to see him at work. Time spent with daughters is always special. I mentioned this garden in one of my posts last month. Unfortunately, it wasn't yet installed when I visited Seattle, but I have seen a few of his traveling exhibits. I love glass. Thanks for the pictures. OMG!! What an amazing and beautiful post not only because of the beautiful glass, but also because of having time with your daughter. Thank you so much for sharing. I think my daughters and I need a field trip! Your pictures are stunning and I cannot pick a favorite. Thanks for sharing such wonderful 'eye candy' for us! I've never seen anything quite like these designs. Very beautiful! Such amazing artistry. Given the number of exhibits now all over the country (and maybe the world), there must be a very talented team of glass artists. Those pieces of glass art are amazing. The first couple pictures reminded me of several enormous light fixtures in the casino at Atlantis in the Bahamas. I was totally captivated. What a wonderful trip for you and D1. I can just picture a little Chihuly nestled in the trees heading down to the dock or a lovely delicate chandelier in the house. Do they do classes there or in Tacoma--seems like the PBS show said something about that, maybe D1 could take classes.